Last edited by Mark R on Tue Oct 23, 2018 5:36 pm, edited 4 times in total. Log hazards immediately after Fairy Steps rapid, on RHS at next narrowing, always a significant hazard between 1 and 2 on Spean Bridge gauge, have finally gone. Never thought I would see that rocky corner clear of wood but it happened this summer. A/WWSR 4/5star (river & sea) with the best! Where are people getting on these days? I last paddled this 12 months ago and there were lots of no access signs in the car park at Spean Bridge Mill. The situation is this for Spean Gorge. At woollen Mill the car park is woollen mill owned. Technically it is private. Car park spaces on far RHS are not I think. In practice woollen Mill turns a blind eye as long as paddlers don't overfill spaces and leave countless vehicles for too long. Ironically this means placing more vehicles at the takeout where there are also issues with a certain gentlemen Jim. At low water drive to High Bridge Cross roads - s on A82, drive 1 km and carry down through marshy woods, thereby missing out the easy shallow or shingle rapids. Park in village somewhere and walk to same put in via car park or through grounds of the small Catholic church on Corriechoillie Road. Warm up by going up Corriechoillie Road to Cour Bridge, walk along woodland path for 200m to confluence, put in there and enjoy very best of middle spean, an extra 1 hour nice paddle including complex 2m (3+) ledge run by different routes and then continue into gorge. Still one of my favourite runs and still frustrated that SCA has not supported their 20 year river adviser to resolve these access issues once and for all.....but then they took funds from selling the guide that we wrote and spent them eslewhere (unethically) instead of applying them to exactly this kind of access issue. 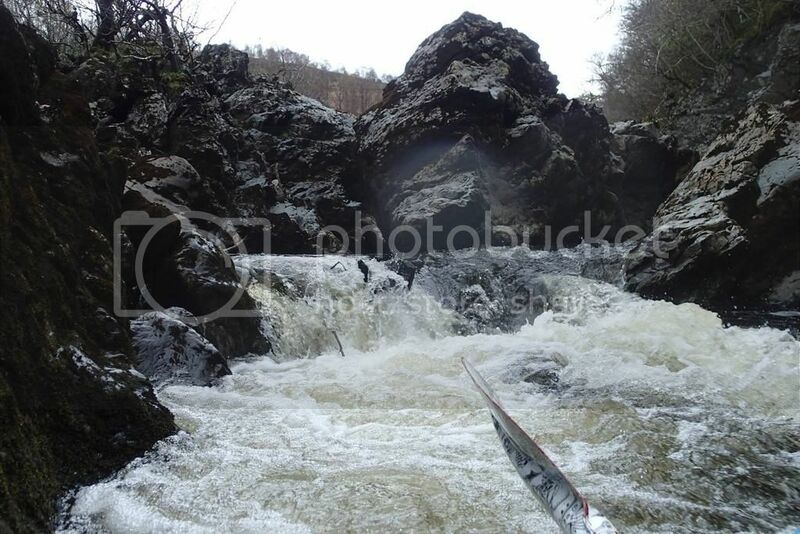 Probably one of the three or four most paddled sections in Scotland. Time to wake up SCA....you are my and other paddlers association, not an adjunct of sports council competition policy only. The comments about the R. Spean egress, and also the WW Guidebook are unfortunate and misleading. Much work was put in by our last Access Officer, Mike Dales (his SNH funding ran out at end of 2011), on this issue, and since then we have not received any further requests for help from Chris. The Spean situation was examined by the local Highland Council Access Officer, but the stumbling block was that no landowner local to this spot would countenance selling or giving land for a much-need car park. The Andy Jackson Access Fund, of which I am a trustee, would consider giving funds for a well worked out project, if approached. This Fund has had all of the proceeds from 'Scottish Whitewater', and also 'Scottish Canoe Touring' paid directly into the fund's bank account for the past few years from Pesda Press, not a great deal of money, probably £400 - £600 per. half year. We regularly look at small projects - the last two river-based ones being on the R. Spey. I am delighted you are reading this. If you wish to support paddlers interest on this river I would be delighted to talk to you. When I made detailed proposals abou the future of access to the Spean, I was sidelined and nothing happened or was acknowledged. Mike Dales was drafted in to pacify the idiot Jim because I was not prepared to have him tell paddlers wehjat they should do or not do, without involving his emplyer SSE. No local landowners were ever approached apart from Forestry Commission who own no relevant land whatsoever. All the early funds from the guidebook were not given to an access charity as they were supposed to be. I instigated the guidebook project, gifted it to the SCA (I was the one that engaged Pesda) and I had to explain to the SCA that if they did not comply then they were actually committing fraud which would be a police matter. Some of what you claim is untrue. You are being a "company man" involved in damage limitation. Talk to me please. I know you represent SCA in the way you see fit and think is best. In this case, regards Spean, the issues have been mishandled and I have been sidelined by SCA becasue in past have been the whistleblower that has kept SCA on track to serve real recreational paddlers. I make no apologies for that. I also represent SCA, which IS paddlers, NOT THE EGOS AND SENSIBILITIES OF BOARD MEMBERS OR PAID STAFF. We would be stronger if we worked together on this river. I have paddled the Spean Gorge perhaps more times than anyone alive and been adviser for quarter of a century. I set up the access committee and gave SCA paid access officials. You inherited my job down the line. I had to resign from it to protect paddlers from Ailsa Spindler (a balloonist and wildfowler and loose cannon) making a paid access post her own by concelaing it from the National Access Officer (me) and the paddling membership. We got Fran, Andy and Mike instead. I was right. This does not need to be aired in public. I would prefer to talk with you and Access Committe, not about past mistakes, which are substantial, but a pro-active stance for the future backed up by support for the man and the paddlers on the ground. I can't be more magnanimous than that. Let's do it? Eddie has spoken, are we to do as we are told? Replies please? Who does he really think he is? We are debating here the access to one of our most popular rivers and the apparent failure of the SCA and peeople like Eddie to take the issues forward. I am happy to publish his response here if folks want to read it. It is quite worrying. But no surprise there.....he is now interim Chairman of the SCA Board, god help us all. So we better do what he says and shut up then I suppose. Let me think about this......a Board Chairman, non-elected as far as I know, presumably about to stand, with no interest in the access to the Spean. Resign I say, if nothing else because your demand that this discussion cannot take place is an outrage. Maybe we should be discussing Eddie's suitability to be SCA Chairman of the Board? Adviser Spean for quarter of a century, member of SCA since 1982ish. Explorer with others of most of the rivers you enjoy today. chrisdickinson wrote: The situation is this for Spean Gorge. Can you supply the OS Grid Refs for the alternative put-ins, etc. we can them marked on a map in the guide. If you have any updates to the guide (or any other guides) please contribute them. Picture from Jessica Leggatt of a tree hazard in the last rapid (29/04/16). According to Matthew Brook the tree has been there a while and only shows at low water. There was a bigger log in the eddy on right of picture that has now gone, but there has been wood here for a while requiring care at low levels. The siphon/archway on Headbanger drop has now collapsed. This has had the effect of reducing flow on far right side and creating a dangerous V fold against the wall that at least one paddler is reported to have been badly pinned in. The jutting rock at base of the drop on left still remains a hazard. A centre line is most likely safest (but at lowest flows this is now a rock), but be aware of the surging nature of this drop. More water makes it safer and eventually easier as flows fill up the basin below. The other good news is that Jimmy, at the takeout has sold his house and is no longer there. Since his move there have been no reports to River Adviser of any problems whatsoever. Please continue to change discreetly and avoid leaning stuff on the fence of the power station. Otherwise we appear to be back to pre-Jimmy days when there were also no problems here. Conclusion? Draw your own.